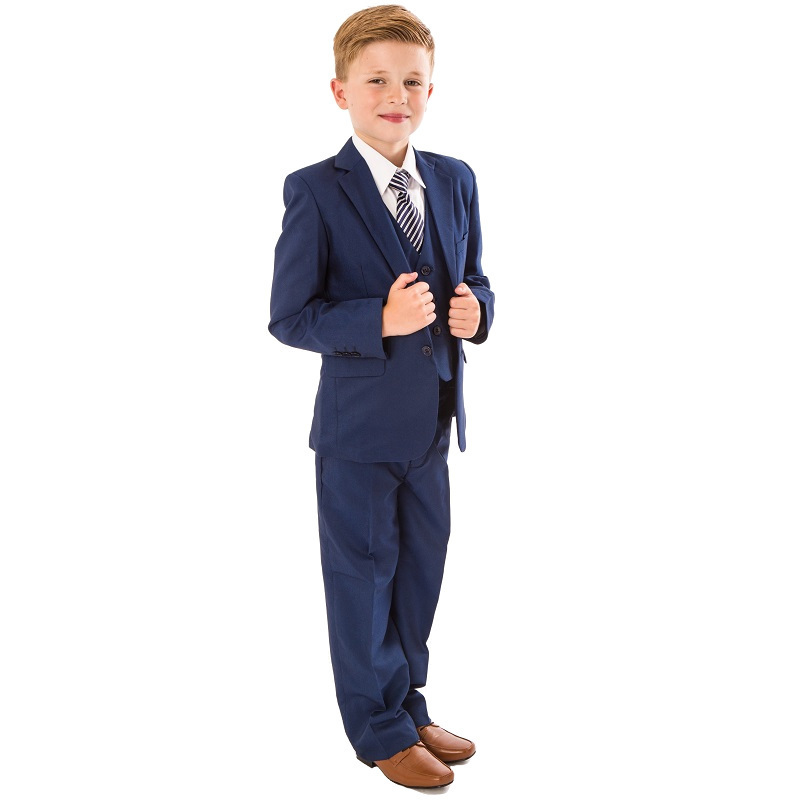 Boys dark blue 5 piece double pocket jacket suit, suitable for a toddler to older boys, perfect for a wedding and formal occasions. This dark blue (shade of rich / french blue) is of a tailored look with great attention to detail. The double pocket, known as the 'Ticket / Hip Pocket' is today's British fashion statement that shows high style. 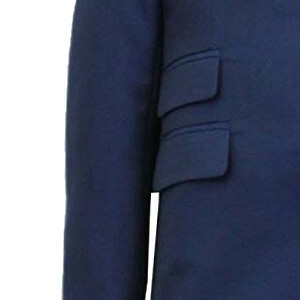 Jacket: Fully lined dark blue jacket, double pockets on one side and single pocket on the other, with single breast pocket for buttonhole / handkerchief, two centre buttons with buttons on cuffs, complete with two inside pockets. 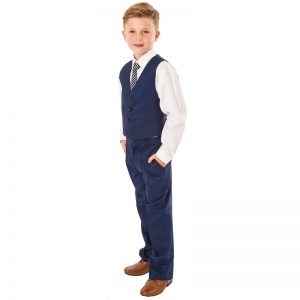 Waistcoat: Fully lined dark blue waistcoat, double pockets, 3 centre buttons, adjustable strap/buckle on back for perfect fit. Trousers: Pleated dark blue trousers, button fly, double pockets, belt hoops, elasticated on rear. 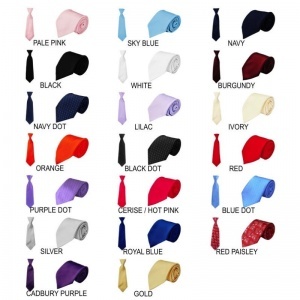 Tie: Shiny satin tie with an adjustable neck strap (colour/pattern of tie may vary). Made with 35% cotton / 65% viscose and has a high quality, comfortable soft feel. 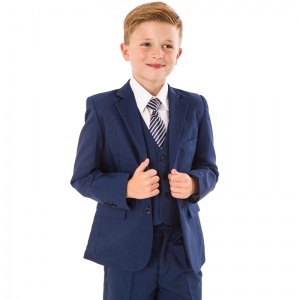 This boys dark blue 5 piece jacket outfit will make him look like the perfect handsome gentleman at any occasion. Complete with tags, hanger, spare buttons and suit cover bag. Trouser Inside Leg 14" 15" 16" 16½" 17" 19" 20" 22" 23" 24" 25" 25½" 27½" 28½" 29½"
Trouser Outside Leg 21" 23" 24" 25" 26" 28" 29" 31" 32" 33" 34½" 35½" 37½" 38½" 40"
Trouser Waist 19"-22"" 19"-22" 20"-23" 20"-23" 21"-24" 21"-24" 22"-25" 22"-25" 23"-27" 24"-28" 24"-28" 24"-28" 25"-29" 26"-30" 27"31"
Waistcoat Chest 23" 24" 25" 25½" 26" 26½" 27" 28" 28" 30" 30" 30½" 32" 33" 34"
Shirt Chest 25" 26" 27" 27½" 28" 29" 30" 31" 31" 32" 32" 34" 36" 36" 38"
Shirt Neck Circumference 12" 12" 12" 12" 12" 13" 13" 13" 13" 13" 13" 14" 14" 14" 14"
Shirt Inside Arm 10½" 11" 11½" 11½" 12" 12½" 14" 14½" 14½" 16" 17" 17½" 17½" 18½" 18½"
Shirt Outside Arm 12" 12½" 13" 14" 14½" 15" 16" 17" 17½" 19" 20" 20½" 20½" 22½" 22½"
Jacket Chest 24" 24½" 25" 25" 26" 27" 28" 30" 32" 33" 34" 35" 36" 37" 38"
Jacket Inside Arm 8½" 9" 9½" 10" 10½" 11" 12" 12½" 13½" 14" 14½" 15" 16" 16½" 17"
Jacket Outside Arm 13" 13" 14" 14½" 15" 16" 17½" 18" 19½" 20" 21" 21½" 23" 24" 24½"
Jacket Length 13½" 15" 16" 17" 18" 19" 19½" 20" 21½ 22" 23" 24" 25" 26½" 27"
Such a good looking suit. I am going to have to save this for when my son gets older because it's pretty big on him right now. But good quality. Will order from this site again! Great Suit for a Wedding, fitted well and comfortable.